Then the small business owner begins to tell me how much money they are spending to boost their posts or to do Facebook ads. I wonder to myself why not try Twitter? 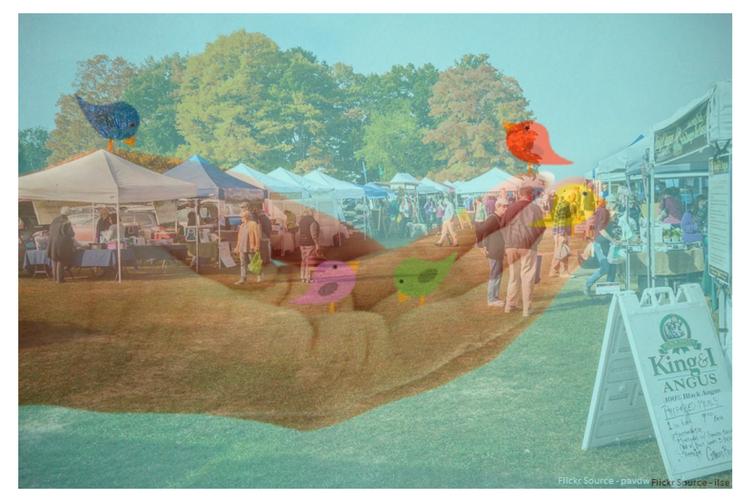 Why Twitter for marketing your Small Business? 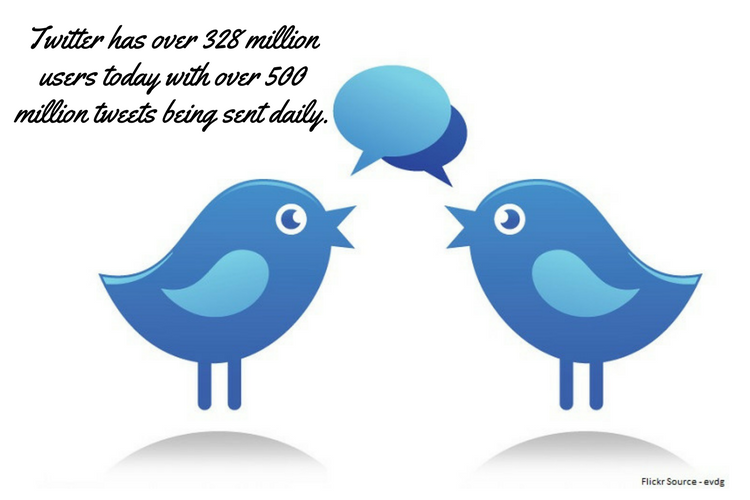 Twitter has over 328 million users today with over 500 million tweets being sent daily. (via https://www.omnicoreagency.com/twitter-statistics/) Of that amount of Twitter users 54% of them earn over $50,000 per year. The top countries that use Twitter are the United States, Brazil, Japan and Mexico. Twitter’s advertising revenue was over $545 million. That’s a lot of dollars spent on advertising there. Something must be working for businesses to continue to spend money on Twitter ads. So, what do all these Twitter stats mean for your small business? That folks who use Twitter have some money to spend and they are not just from the United States. 79% of Twitter accounts are based outside of the United States. Therefore, if you want to sell something worldwide or down your street Twitter is the place to be today. 2. Really just tweet away. Many times, I’m looking at a small business website and see the Twitter symbol. I click on it and it takes me to an inactive Twitter account. It hadn’t been used in months or years. That’s terrible. Why have the Twitter logo on your website if it’s inactive? That’s like false advertising. Keep your Twitter account active or get rid of the symbol from your website. 3. Tweet Regularly. If you can tweet daily, at least Monday-Friday. Find 5 minutes in the morning and another 5 at the end of the day to follow up with anyone that tweets or DM’s you. 4. Set Up Twitter Notifications. This will help you to respond fast to any customers that may tweet you questions or send you a DM – direct message. People love quick responses from Twitter. If not, they would send you an email and wait patiently. Twitter is for speed. Have the Twitter notifications alert you or have someone manager your Twitter feed for you. 5. Engage with others on Twitter. You can tweet out interesting tidbits about your industry or products. But don’t push out sales tweets one after another. Go by the 80/20 rule. 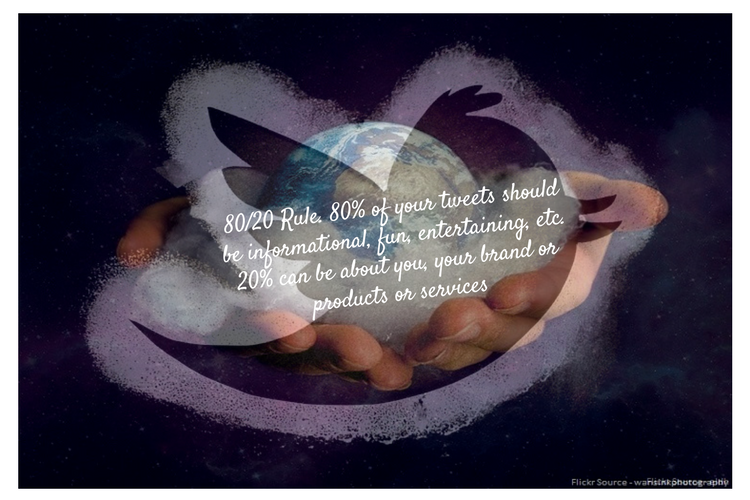 80% of your tweets should be informational, fun, entertaining, etc. 20% can be about you, your brand or products or services. What Else Can Your Small Business Do on Twitter? 1. Share stories about your business or industry. This step will help you become an authority on the topics. People will come to you with questions. People will begin mentioning you in their blogs and it will begin to snowball. You will increase your circle of network and you will gain more customers in time. 2. Be sure to check any DM’s in your inbox. Many can be spam messages but they are also some from people requesting more information. I’ve received business right from Twitter DM’s. So be sure to check yours. You can set up notifications for them on your mobile device. 3. Do videos and/or SlideShare. These are great for sharing via Twitter and other social networks too. This mixes up how people see your tweets in their streams. People love video today. SlideShare helps gain more audience growth too. 4. Participate in Twitter Chats. Once you learn how they work, start your own. These can be invaluable to show your knowledge and possibly do a giveaway right on Twitter. Be sure to promote your Twitter chat prior through your website and or email. Be helpful throughout the chat. People will appreciate it and you will gain some more followers this way. 5. Schedule Your Tweets. Twitter users do not like to see the same tweets or a user tweeting one tweet right after another. Use a tool like SMhack, Elokenz or the Buffer. They are a great way to be sure your Twitter account stays active. These tools can also do the same for your Facebook, Google+, Pinterest and Instagram accounts as well. 1. SEO factor. 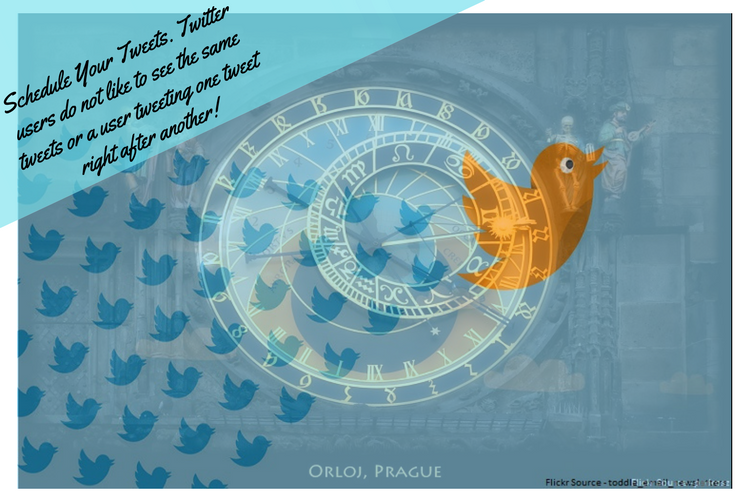 Did you know your tweets can also help your website’s SEO? Google shares tweets in their search results. It gives you site when someone clicks from the tweets to your website or blog. This helps your ranking as part of Google’s 200+ ranking factors. Have a twitter tweet button on all of your websites pages and even products. It makes it quick and easy for users to share a tweet. 2. Let people know you are on Twitter. Use the Twitter handle in your other marketing efforts offline and online. Include your Twitter handle in your emails, your billboards, etc. Ask people to follow you on Twitter. 3. Start a blog if you don’t have one. This really helps to generate more content for your social media marketing overall. It should be your home base for your social media marketing efforts. Twitter works really well with blogs. Be sure to be there too on Twitter if you want to sell B2B. Another great IFTTT recipe I love is the one that shares your Instagram photos right on Twitter. If you only share from Instagram the photos do NOT show up in the Twitter stream. This IFTTT recipe does it for you automatically. This feature is great if your business has a lot of images that people love to share. If not, you can always get creative with that. People love sharing visually appealing images on social media. You can also do Twitter ads. You can use them to generate more followers or to generate more visibility of a tweet you want seen by more people. You can spend as little as $5 and of course you can spend a lot more too. They provide targeting capabilities like Facebook ads now offer. Twitter offers its own analytics that can be very helpful to see who is seeing your tweets, what they like, respond to etc. You can see the demographic of your audience as well. You can learn a lot by checking these stats monthly. I was surprised to see my audience demographic. I started to tailor more tweets for that demographic since. Too many people and business give up on Twitter before they really get started. It’s not a sprint – it’s a marathon on Twitter. It will take months to get real traction on Twitter. Follow at least 200 people to get started. And then continue to follow more weekly. Use Twitter Lists. Add them to lists to stay organized. Make a list for customers, for industry news, products, services, etc. It will help you stay organized and focused easier on Twitter. Have Fun. You can follow things of interest too on Twitter so you will enjoy it more and use it more. I love following weather folks during storms and weather events. I have a list for them and use it when applicable. Twitter today is a must for small businesses to network with others, become an authority in their niche, generate leads and make sales. Have you started to use Twitter yet? 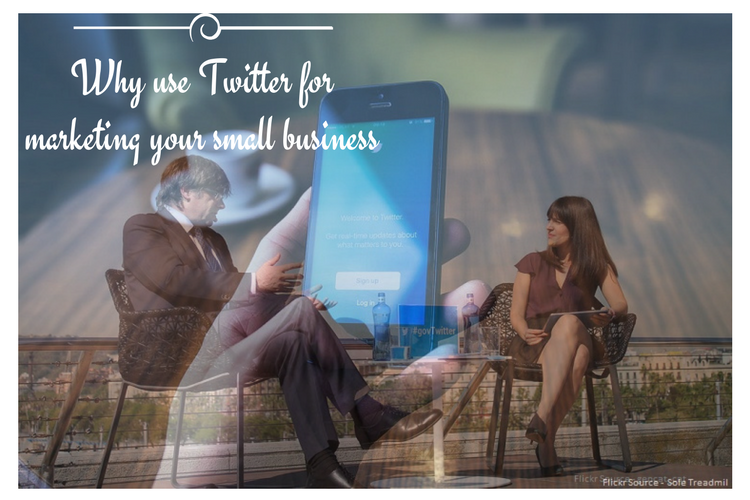 Have you found Twitter marketing for your small business working today? I’d love to know more in the comments below. Twitter is not only the best social media platform to drive traffic but also to get massive leads. Specially by using trending has tags one can get many more. This article really help me a lot. I am facing the same problem and not get the solution but after reading your article I get the solution and also help me to get more follower at twitter. 1)Being self promotional too much. Things have got to change though. Now that I have read this blog post. Tweeting 10tweets in a second will just make users unfollow you. I totally agree to you that for small business twitter marketing is best but some time it don’t work bcz they don’t know much about twitter but your article is really very informative thanks for sharing with us! Thank you so much for this informative blog post. I haven’t started yet to use twitter but after reading your post, it is definitively something I should consider learning and trying out as soon as possible. Thank you for these tips about SEO factor and the HELP in terms of generating more content for the social media marketing overall. What a well comprehensive strategy you have given to us with this article. Twitter sure is a must do when running an online business. It may take a while to get organized, but once you do, you can tweet your messages all day long. Not that I’m saying to spend all your well deserved time there, but use some of the various ways to schedule your Twitter posts. There is a certain etiquette we must use on Twitter, and that is that 80/20 rule that you mentioned. We need to be social there and share other people’s blog posts and let’s not forget those “thank you’s” we must Tweet for those people who share ours. When it comes to paid ads on Twitter, it is so effective and doesn’t cost much money to do. I’m so glad you mentioned that it takes time on Twitter to gain momentum. Just like any other social media platform, patience and consistence is key. about the momentum though, once you get it – Twitter is really effective! Thanks for the article. I forgot how beneficial Twitter still is to bloggers. Most people have been too busy using Pinterest and Facebook. I definitely will start using Twitter more to drive traffic. Twitter is such a great place to connect to people. It is also so much fun when you are at a function and live tweeting. Yeah, I like the live tweeting thing – have done it on events in the past, works really well. Hello Oleg! I had not idea that you could advertise on Twitter, I will have to look into this one more! I am a whole lot more active on FB and do forget about Twitter most of the time, so this was a good reminder for me..
Yeah, we often forget that Twitter too has a facebook like system to advertiser – but yes, Facebook has been a lot more easier to advertiser, boost posts etc. compared to Twitter where it wasn’t as easy before. This article really helps me a lot. I am facing the same problem and not get the solution but after reading your article I get the solution and also help me to get more follower on twitter. hi, thanks for article, i think twitter can help us to make traffic for our sites. ofcource twitter in my country is filter but we use it in our site, linked in social media and etc. i’m sharing this article with source (=your site) with my friends. thank you. I’m mostly using Buffer and CrowdFire to manage my Twitter account. I know I should be more hand-on myself, but at least the discipline of CrowdFire prompts me to interact every day. My followers etc are increasing, and are more targeted now, so I will persevere and look forward to seeing results. I agree with the 80/20 rule but at the same time publishing content on twitter and not getting interaction won’t be a bad idea. What do you think about auto-posting when a new article is published than wasting time on tweeting one by one? Twitter has a lot of potential for any small businesses. Marketing the content properly really matters a lot. Though it’s quite crowded and the posts can get hidden into that. I agree with the point you made, most of the B2B buyers are twitter addicted. Which itself, opens a lot of doors. Using Twitter effectively can give the better results. Though Twitter provides the analytics to track the statitics which makes it much easier for further marketing strategies. Thanks for spreading the value… Loved it! Yeah, that is how Twitter usually is – which is why the life of a Tweet is so small, but that is what attracted so many users too. I guess on Twitter people are generally adapted to the fast moving timeline – though many will just skip the timeline due to the amount of tweets that falls into it every minute! I think being such a popular social platform, Twitter should be the first option where one should promote his blog or business…equally Facebook, Instagram, google plus will also be used for promotion and sharing of your business or blog updates…marketing through these social platform is very easy and free….great post..thanks for sharing..!!! All of these top platforms are free and if anyone is prepared to dedicate some time for marketing – then getting a following and pushing some business through these channels are absolutely easy! Please guide us that “How to Increase the Number of Followers” in Twitter ????????? There’s many ways to increase your follower count on twitter, but the best way is to unfollow those that doesnot follow you and keep looking for more relevant people and follow them. You can follow and unfollow 1000 people daily – and that process will get you 100 to 300+ followers everyday. This process is simple and it always works! Maybe I will see you at a Tweet Chat soon. Really how much minimum traffic can we get form twitter ? twitter in my country is closed but we are using this social network with vpn. i think we should use twitter for sharing articles. twitter is the best. Sad to know that Twitter is blocked in your country, but still people find a way (VPN) to use the platform anyway. Hello Oleg thanks for sharing this artical. For me facebook is better than twitter in promoting a small Because almost all uses facebook nowadays. But still twitter can add traffic. Wow great article on why bloggers and businesses should be marketing on Twitter. I’m finding Twitter rather addictive at the moment for it’s ability to drive traffic to my blog. Twitter is responsible for nearly as much free website traffic as Facebook. It’s a fantastic platform to gain credibility, build SEO and branding – I love it! Good to know that the referral traffic coming from Twitter on your site is as many as that from Facebook – this is surely a great comparison on why people should always utilize more than one traffic source. A very comprehensive article. I do not use twitter much, it seems I do not really understand how it works. Now I have a better view on it. Thanks for this interesting insights. Thanks for sharing the this valuable information. Many people say that using twitter is kinda tricky but after reading this article, I hope many people got to know a bit more of using Twitter! Now that you mention the 140 characters – they have already changed that, which gives you more characters to express what you have in mind! I was actually just wanting to spend a few minutes this morning to see if I could improve my Twitter marketing. I really don’t focus a lot on Twitter. Most of my traffic comes from Pinterest, so most of my efforts are spent there. However, I do know the importance of having a presence on Twitter. Love your tips about saying how important the 80/20 rule is. I actually try to use this for all the social network sites I use. It’s so easy to fall into the trap of where we are constantly sharing our content too much. I’ll definitely start using some of these tips to see if I can improve my Twitter performance. Looks like the motto applies to everything online. It takes time to see the results. Thanks for taking the time to share these tips with us. Yeah, the same idea applies to all social networks – promoting others and sharing genuine and helpful content for the most part, with a bit of our own self-promotion keeps things in perfect balance. Good to know that Pinterest is working out well for you – that networks sends us some traffic too. Twitter is a great platform – just that I realized it quite late. I used to be afraid of the noise I see on that platform. It took a while for me to get used to it and now I find it to be a great platform and yes one of the top referrer of traffic to most of my sites. Thanks for sharing the nice tips here. Agreed that most people see the noise as a big turn-off and that makes sense because the twitter’s timeline is possibly the most active ever! Leads from Twitter has been pretty good for us too in terms of both relevancy and quality. What a great post you have. Social media is an amazing marketing channel, and Twitter on its own is a remarkable digital marketing tool that can easily grow your business if used correctly. For many, they’re not making the most of Twitter. But I’ve found Twitter to be the best social media marketing platform. In fact, about 65℅ of my clients are from Twitter. The tips you presented are amazing. However, I’ve learned a few tricks that I must implement. Social media is amazing platform for promot business. We know about social media power. Many people neglect Twitter for other social media platform such as Pinterest and Instagram, but I definitely believe that Twitter still has value for business owners. I wish I would have started using Twitter hashtags earlier. This was a great beneficial post Oleg. Thank you! What about Twitter ads? Can I get results like Facebook or better? Yeah, twitter ads are much like facebook ads but you can’t compare them as both are as good or bad depending on a lot of factors! All things considered, clarified. Twitter assuming a major role in advertising and sending some OK traffic with leads as well. By the method for mine, I am utilizing the twitter account in every day with few tweets, retweets and love likes to others and follow back who followed us and follow all individuals’ who had take part in our tweets with every above movements. Actually, I am getting a couple 10 leads to my business for every week. Its appears to be extraordinary for me. In the event that I accomplish more on twitter, at that point beyond any doubt, I will get to an ever increasing extent. Thanks for your great post Oleg.. It is great to know that you are already getting 10+ leads a month from Twitter from Organic marketing alone … this is already huge! Really an amazing read. Thanks for that. I have been growing my Twitter for almost eight years and got 135K genuine followers by now. So, with my eight years of experience on Twitter and as a freelance social media marketer, I have to say that people are still not using Twitter analytics like Google or Pinterest Analytics. I don’t know why but, they rely on other third-party apps for Twitter, not Analytics tool on the Twitter itself. I always ask my clients to see the Twitter Analytics. Please write an article about Twitter Analytics alone. I think you are the best for that. Social media is the amazing platform for promoting business. Thank you for sharing this article with us. twitter is a 3rd largest social media site.millions of people are active on twiiter so if anyone want to grow his buiness online twitter marketing will be very helpful to get his small business success. Twitter is not only a social networking platform but also a great marketing platform for our business promotion.